Make the basil pesto In a large pot of boiling water, blanch the basil until bright green, about 30 seconds. Immediately shock in a bowl of ice water. In the same pot, blanch the baby spinach until soft, about 2 minutes. Shock in the same ice water. Wring out the basil and spinach to release excess water and place in a blender. In a small pot, warm the cream and butter until the butter melts. In the blender, blend the basil and spinach until roughly chopped. With the machine running, slowly stream in the warm cream mixture. Add the Parmigiano-Reggiano and blend until a coarse paste forms. Season the pesto with salt and pepper. Make the gnocchi In a large pot of water, boil the potatoes until tender, about 30 minutes. Drain the potatoes. Line a large rimmed baking sheet with parchment paper. As soon as the potatoes are cool enough to handle, scoop their flesh into a ricer or tamis and rice the potatoes onto the parchment paper in a shallow layer. Let cool completely. Add the flour in three batches, gently mixing until incorporated. Knead lightly to form the dough. Avoid overworking it, as that will create a heavy and dense gnocchi. Line a baking sheet with parchment paper. Divide the dough into quarters. Working with one piece at a time, gently roll the dough into a long rope about 1/2-inch wide. Using a sharp knife, cut the rope into 1/2-inch pieces. Roll each piece against the tines of a fork to make light ridges. Transfer the formed gnocchi to the lined baking sheet. Repeat with the remaining dough. In a large pot of boiling salted water, boil half of the gnocchi over high heat until they rise to the surface. 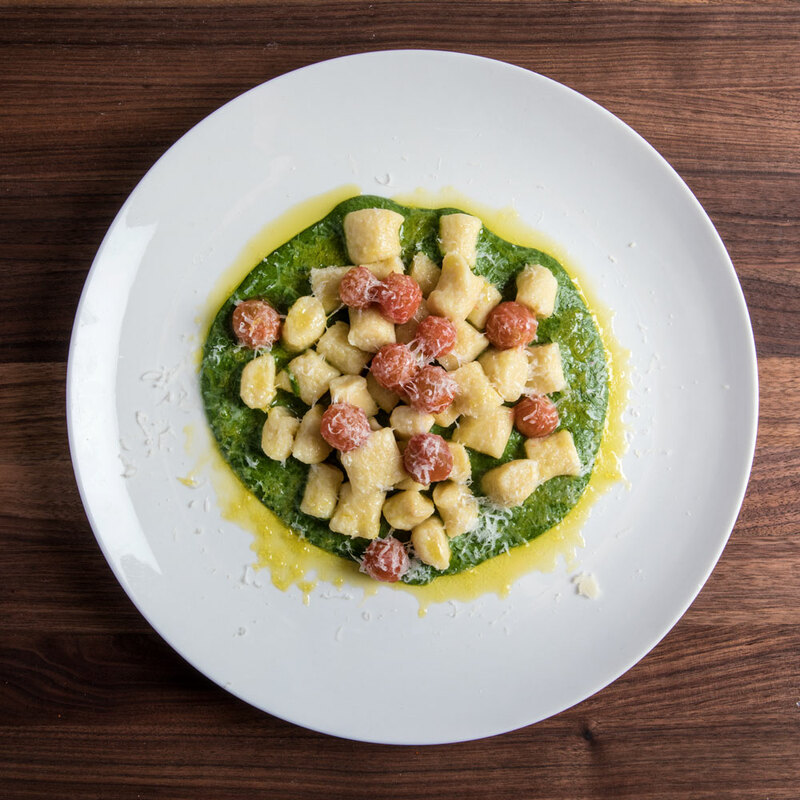 Using a wire skimmer, transfer the gnocchi to a large bowl and toss with some of the pesto. Repeat with the remaining gnocchi and more pesto, season with salt and pepper and serve. Review Body: Italian is my weakness and I am going cook this!